Since becoming serious (as much as a non-humorless person can be said to be) about collecting Tamiya, rediscovering it after the beginning of the re-release era, it turned out I wasted a lot of time, effort and resources on quite a few projects and purchases that I thought were vintage but weren't... or that were but I thought nothing of replacing parts with new re-issued parts thinking they were identical. Often the differences / tells were staring me right in the face but I didn't know what to look for. Even now, and even among experienced members and collectors I find there are pockets of knowledge many have on this subject with respect to a few models they've become sort of 'specialists' in, and simultaneously quite a bit of uncertainty or total unfamiliarity for others. Although there are some resources that do a great job of introducing and explaining the situation, such as this excellent post from the TCer @Hibernaculum on his own blog, there is no one place I could find that could be considered a good central reference for someone trying to find out how to tell if something is original / genuine / vintage or not. By no means do I know enough on my own to fill this need, so I invite you all who know anything from one little tip to an encyclopedic knowledge of every variant of a model Tamiya ever released. We may as well also include Kyosho, Associated, etc to the extent relevant. The format that I think would be easiest and most useful for expanding on the existing compiled notes on a given model is to keep each post related to one model per, then anyone who'd like to add details or make corrections just quote or copy/paste the full contents of the most recently updated information about that one model, add their piece or modify what was there if/as needed... and then do the same separately for any other model(s). I don't have time right this second to do a complete coverage of the Frog, which I'll start off with since it was a couple mislabeled-as-vintage Frog items that made me think we needed a place to store and reference information like this. I also think it's important that people know they can add just fragments of useful information and don't feel like they need to post perfectly-formed analyses covering everything about a model. It's fine to do that, but not necessary, and I think we'll amass more useful information by keeping the bar low. If you have $20 of info to contribute, great... but also great if you only have $0.20 to add right now. So, I will start us off with a few Frog things in the next post. ps - I want to point out that for the most part, parts or models that are described as vintage or original that aren't one or both usually aren't the result of intentional misinformation. It's probably just a lack of knowledge combined with an under-appreciation of the significance of the difference that results in the proliferation of these kinds of mistakes. But it certainly doesn't help people who do care but are still learning develop an accurate knowledge. Hopefully, this thread can help. Item Description: "Vintage Tamiya FROG Body and Wing new uncut unpainted by Tamiya"
Item Description: "Vintage Tamiya FROG Decals new GENUINE not a ink jet copy By Tamiya"
Thanks Terry! What I think we should do, unless others disagree, is aggregate all the other reliable information we find together in one place here. That way people don't need to dig through the entire thread to get all the info we've documented in order to find links to other sources, then probably have to go through those as well. Instead they'll be able to just search the tread or start at the end and find the most recent entry for a model and that should have all the details we've found (that we collectively think are reliable) together in one place. Do you want to try adding some of the details from those links into a re-post of the Frog entry? If not I could try later today / tonight. Beef, its not a bad idea, but I think to do it right, you are going to need a new, separate forum title, and then start a new thread for each and every car that was re-released.. Some cars wont need much space at all to list the differences eg Sand Rover/Holiday Buggy, but then others the list could be quite long, eg Super Champ V's Fighting Buggy.. I think what you suggest might (eventually) be a good idea. For now, though, we can get started like this. If / when we compile enough info it starts to become difficult to navigate, and if it's demanded by members and OK with the mods, then it should be pretty easy to reorganize like this... given the whole cumulative concept. My only concerns were that if the information was put in say the re-re thread, what is to stop it being buried in a few days, weeks, months..
Its a great idea though.. When are you going to start it?? You guys may also be interested to learn that my blog article (which beefmuffin linked to) is the most popular article on my entire website - day after day, week after week, month after month. To date it has had over 40,000 hits, and has earned a very high organic Google ranking on the subject. (The site overall, has had over half a million hits to date - a lot more than I expected when I began, so I appreciate all the visits and referrals). I have long wanted to expand upon it with a detailed list of differences per Tamiya model, in a follow-up article. So perhaps I should post a follow-up article? But one that is built from collective information from anyone who submits it - i.e. people send their information to me. I will collate, and update the article with each new fact. This may ultimately lead to much higher visibility on the subject long term, than a forum topic (which may sink down the forum order, or not get as high of a google rank). 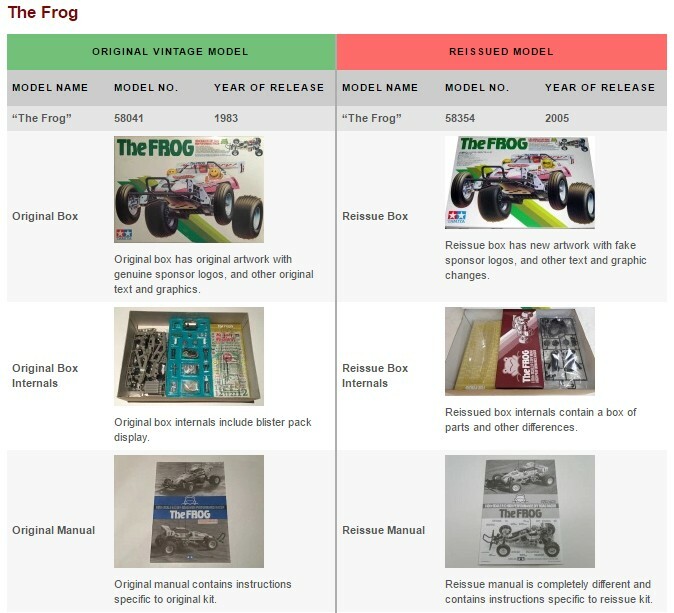 I'd suggest maybe calling it: "A detailed guide to Vintage vs Reissue Tamiya R/C kits" ie. therefore it's like a natural sequel to other one, which was "A quick guide to Vintage vs Reissue Tamiya R/C kits"
I'll need your help/knowledge/wisdom - as Beefmuffin has said, this can only ever be done through collaboration. The only reason I hadn't done such an article already was because I just don't have all the information myself. I'm very vintage focused, and very careful about what I buy when looking for vintage. I used to have some reissue kits, but I sold them all many moons ago, making direct kit comparisons harder. We should aim to start small, but just keep adding to it over time. We won't complete it all immediately. My site is (and will always be) 100% ad free. I've actually rejected quite a few offers of sponsorship. The only 'commercial' aspect, are the few cars and bits from my personal collection that I sell. So I just wanted to be clear about this aspect - my site does not generate anything through traffic/sponsorship, and never will. Simple. My website is going to be online forever. I am actually not kidding. I hope I've got a few decades left in me for starters But I intend to "pay forward" my website costs in my will one day. So if there are any Tamiya collectors around in the year 2100 (and I am quite certain there will be), they should still be able to experience the "thrill" of reading my ancient drivel, in addition to any excellent information I was able to collate from readers. I'd be contributing (some of my own info), but otherwise just formatting and collating everyone's else info. A special form could be set up to capture submissions specific to this article project. Anyway, it's just a suggestion. If you guys feel that the forum is the better place for all this, then that is completely fine also! But I support the nature of this information enough, that I'm happy to host and maintain it. Yep, this wealth of information (currently in the heads of many individuals out there) definitely needs to be preserved once and for all, hey. It's important to consider that if we were all collectors of, say, vintage furniture, we would presently have decades worth of experience in knowing exactly what was original/vintage, versus reissue or fake. Because furniture dates back centuries and the reissues and fakes have been around a long time too - long enough for collectors to become well aware of them, and for many books and other resources to be written about it all. But collectible R/C cars are a VERY young collectible area, compared to most others in the world. And the concept of "reissues" is itself barely a decade old, in this hobby. This is why, I believe, the level of interest in knowing about differences has grown over time - and will continue to grow - as more people become aware. Ultimately, most collectors (of anything) want to own an examples of whatever it is they collect that are "authentically from the heyday" of that thing. Simply because this is what has the most meaning, in a collecting sense. You will notice the Evolution of the Tree: Brat, then Frog, then finally MB (and presumably BF), You will also note that all of the ReRe's have the same C part tree, eliminating cost for Tamiya. Original C Part C1(x2), C2, and C4(x2) got split off when the Brat moved to the Frog and later the MB. Further, Original C Part C7, C8, C10, C13, and C17 are missing from the new ReRe C Parts Tree... But they have added C18??? Hey H. I think the idea of having a page on your site where the results of pooling together all this info will be curated is an awesome idea. I don't think it's a one or the other kind of thing. The key thing we both point out is that this can only be done by pooling together bits of individual knowledge from many of us to make, an ever-changing(ish) amassed resource. In my opinion the natural place to do the 'pooling together' part is here on the forum. Any of thousands of collectors can add their little piece directly into the pot without anyone's intervention. With any luck there will be many such little pieces... which doesn't necessarily lend itself to maintaining organization of the aggregate. In my mind that's where you and your new page can come in curating the information stew bubbling up in the forum into an orderly reference suited to a wider audience. So maybe we proceed with the agreement that this is how it'll work, and people who add details to this thread can expect that their contribution will end up being included in your page.. We could call you "The Curator" (cue dramatic theme music)! Completely agree with all of the above, as I agree that the forum is needed for working it all out and possibly even debating/confirming things. I'll start setting up my page this weekend then, and also add a form there for any direct-info submissions/corrections etc. Once it's ready, I will post the link here. In the meantime, anyone with info about a specific model where they know of differences between the vintage vs reissue kit, should feel free to continue to share it here. Or if you are feeling particularly energetic - find some info in other (old) threads that are currently buried in the forums, and repost the info here. I have not finished all the Frog parts yet (a few more still to go - I will add more tomorrow). But feel free to comment on it so far. Going forward, I would appreciate photos of reissue parts, as I don't have any reissue kits and have been grabbing them from elsewhere. Preferably photograph the parts on their own (ie. not within built models), for comparison to the parts as they came in the original kit. We don't have to go down to the level of every individual little part. As you can see, I am doing it by parts tree, and general following the groupings of parts as they came in a kit, so the whole thing doesn't become a massive chore. Overall...it seems to make manageable sense to use photos from original NIB kits as the starting point, and show the equivalent reissue part beside them. This is AWESOME stuff @Hibernaculum! Will get a chance to add more soon. Cheers Ben. Yeah, it's a bit of work, but well overdue. I just have a couple of parts left to detail on the Frog, then I will move onto another vehicle and start putting that together. As always, anyone is free to correct me on any mistakes or omissions I make. Does anyone have a photo I can use of a reissue Frog body and wing? (just body and wing together, no decals). Just to fill a blank space. Also, does the reissue body come with overspray film? Just want to confirm this. And do any of you write to those eBay sellers to inform them about incorrect (or fraudulent) listings, like the ones Ben described at the start of this thread? I'll have a bunch of stuff to post up this weekend. Heavy work week. It's not easy getting on stage all oiled up for the ladies night after night. Constantly flexing all my bulging muscles while still looking relaxed takes a lot of practice. OK, I got a replacement body, and it is also the Re-Re, ie no power switch hole and no pre-cut motor hole. He did send me an Original Wing, so now I have both a Re-Re and an Original. I can understand why the guy thinks he has Original bodies. The two he sent me are embossed with "1983" and the Original model number "58041". #1 - The Re-Re wing. Has "58041" and "07" embossed. This has overspray film on the top. #2 - Original wing. No embossing, and no overspray film. #3 - Re-Re body. Embossed with "58041", "07", and "[copyright symbol] 1983 Tamiya". The Re-Re body has overspray film. #5 - Re-Re body - No motor cut-out. #6 - Re-Re body - Embossing and film. #7 - Re-Re body - Embossing and film. Perfect Terry. I'd forgotten about the embossing too, which is likely to fool some sellers into thinking the reissue body is vintage, when it isn't. Original lexan never had embossing AFAIK.